In 1953 Dr. Henry Millicer defeated 103 other contestants in a design competition held by the Royal Aero Club of Great Britain. The design was for a two-seat light aircraft. A small team was formed to build a wooden prototype - VH-FMM - which first flew on the 31st of March 1959, piloted by Flt. Lt. Randall Green. Promoted by the Victa Lawnmower company and it's founder, Mervyn Richardson, the company formed an aviation division in 1960 to manufacture and develop Millicer’s design as the Victa Airtourer. The first prototype flew in December 1961 with the first production machine flying in mid-1962. The Airtourer was an immediate success, so much so that the U.S. manufacturers of light aircraft began to dump price their aircraft on the Australian market. Victa applied to the Australian Government for protection against this tactic, but in early 1967 after a much delayed Tariff Board Hearing, Victa closed down production. A total of 170 Airtourers had been built. The tooling was sold to AESL in New Zealand which continued to build the aircraft. 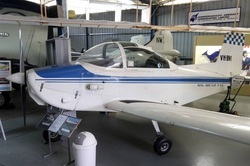 AESL developed the 4 seat Victa Aircruiser design into the successful CT4 Airtrainer used for primary pilot training by many airforces including 50 by Australia's RAAF, and later 26 by BAE Systems at Tamworth, demonstrating the lost opportunity of ongoing Australian manufacture caused by the Tariff board decision. The Museum’s Airtourer, VH-BWI, spent most of its life with the Aero Club of South Australia. It was acquired by the Museum in 1989.